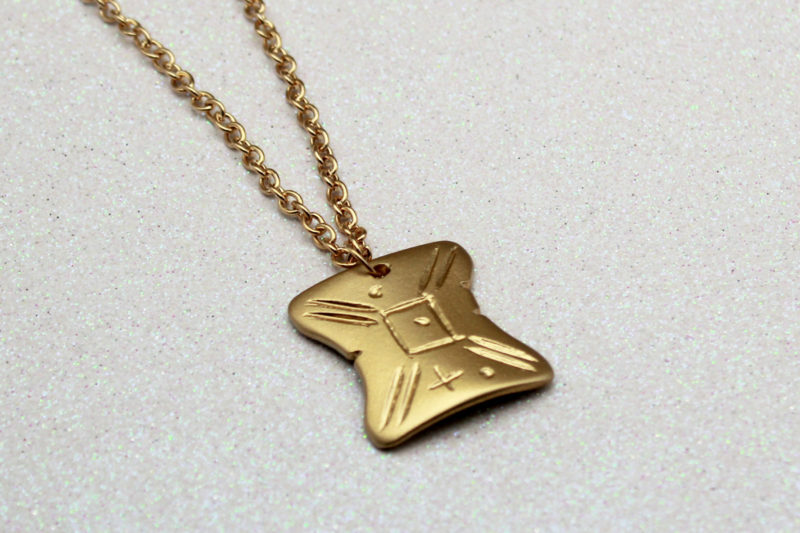 Today’s Star Wars fashion DIY is a Japor Snippet necklace, inspired by the gift Anakin gives to Padme’ in The Phantom Menace. This is a rare example of a romantic gift in the Star Wars films, and it continually frustrates me that no licensed company has created a jewelry version of the necklace! To me, it is a wonderful theme for a subtle Star Wars jewelry item that can celebrate your love for Anakin Skywalker and Padme’ Amidala, or your love for your partner. 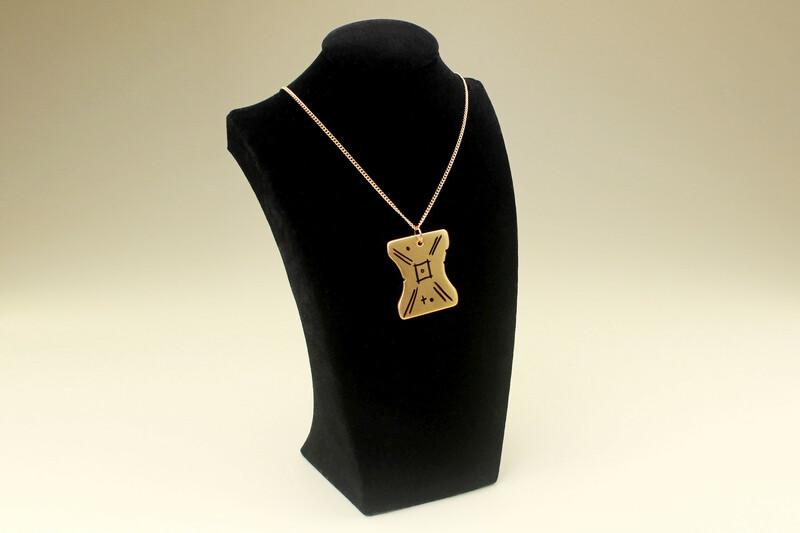 On our very first Valentine’s Day together, my husband gave me a japor snippet necklace he hand-carved from wood. It was the most romantic thing this Star Wars fan had ever received – I wore it inside my wedding dress 2 years later. As it is a prop replica, and has significant sentimental value, it is not something I can wear everyday, so I wanted to create an ‘inspired by’ jewelry version. I used my own japor snippet replica for reference, but there is also a great screenshot from The Phantom Menace here. I sketched out the basic design on paper – according to the Episode 1 Visual Dictionary, these are ‘traditional Tatooine sand symbols’. 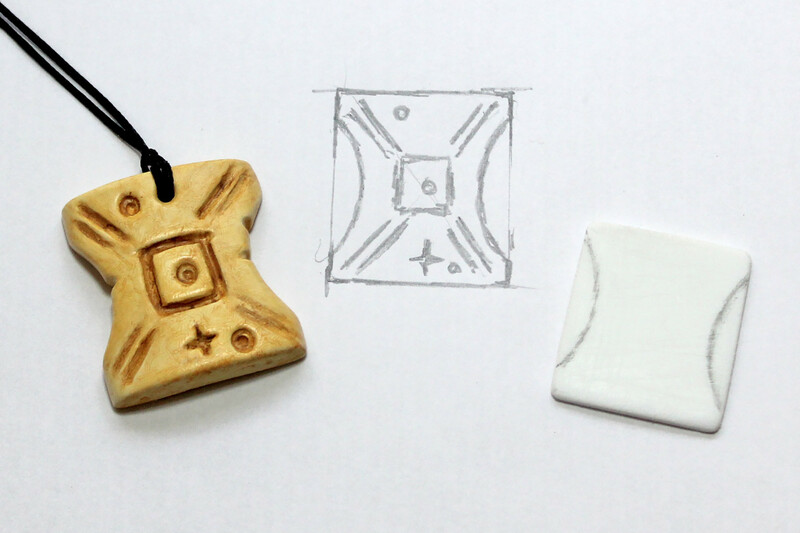 For my jewelry version, I decided to make the pendant a little smaller (29mm by 26mm), but you can choose your own size. 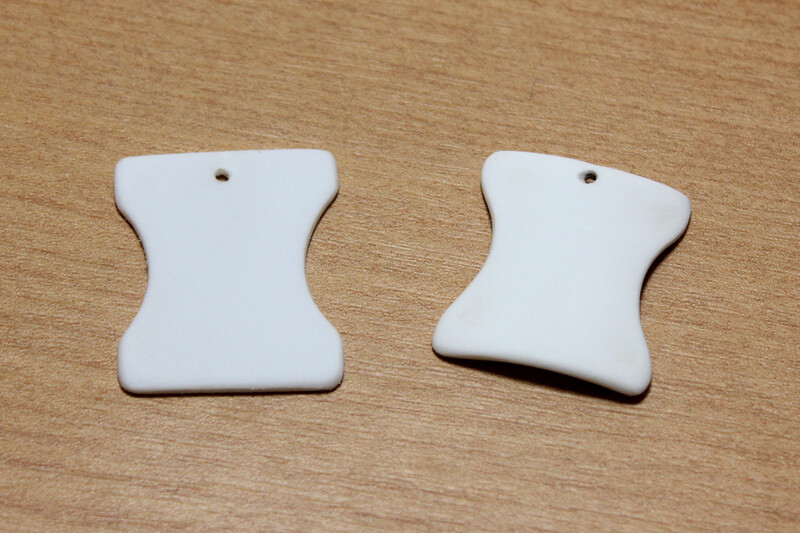 I cut out my pendant shape out with a retractable cutting blade – scoring the blade hard across the surface creates a cut, which you can then ‘snap’ the plastic along. I sanded the cut edges with sandpaper to create a nice smooth edge – now I have a basic pendant shape. I drew the side curves onto my pendant with a pencil. The easiest way to sand the curve evenly is to tape a piece of sandpaper to a small round object like a length of dowel/broom handle etc. I gently sanded the side edges until I got a nice curved shape I was happy with. The next step was a little tricky – the hole at the top to attach the jump ring through. I marked where I wanted the hole to be with a pencil, and took a small nail and very carefully hammered it into the marked spot (I put my plastic pendant on a piece of wood, but a hard surface will do). I made sure to practice first on a scrap piece – the trick is to go about half way through, then repeat on the other side. 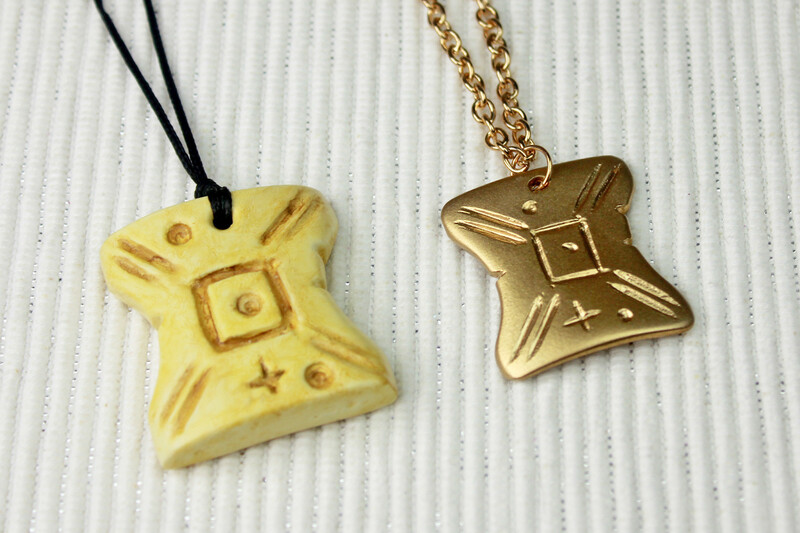 Above you can see 2 of my pendants – the one the left is flat, while the one on the right has been curved. To achieve the curve, I gently heated the pendant with a heat gun (while it was lying on concrete, not in my hands! ), and quickly pressed it inside the edge of a PVC pipe. It took a few goes to gently ease it into shape – too hot and you risk hurting your fingers. 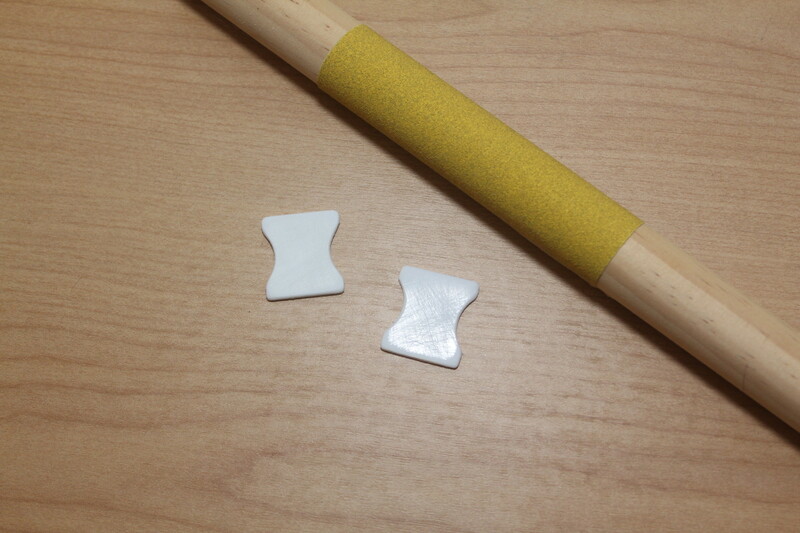 If you prefer, you can cut your shape from a thin PVC pipe for a pre-curved shape. The next step is optional – on one of my pendants, I took a Dremel hot knife and very carefully engraved the design (after practising a few times on a scrap piece of plastic). This gives a closer finish to the original design, but does require additional tools. 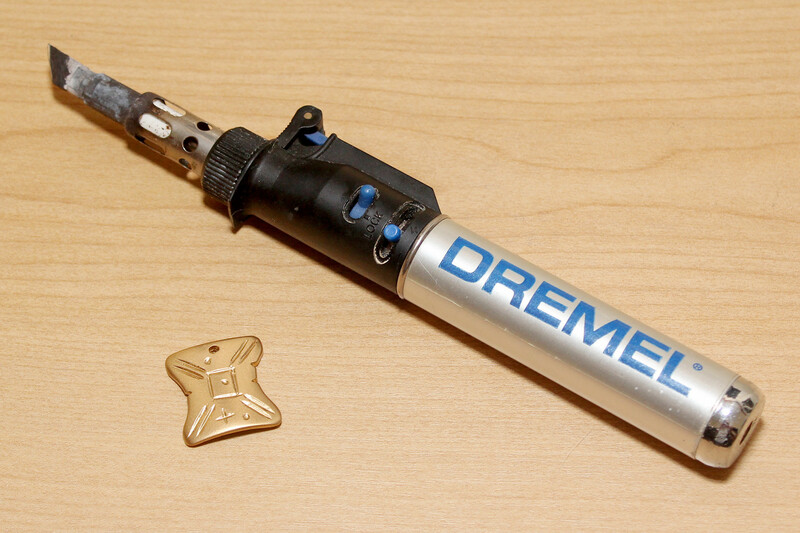 I had also tried engraving with a standard Dremel (rotary tool), but the hot knife gave a cleaner edge to the cuts. I also used the hot knife to create the small ‘knicks’ in the side of the pendant (one on the left curved edge, 2 on the right curved edge). 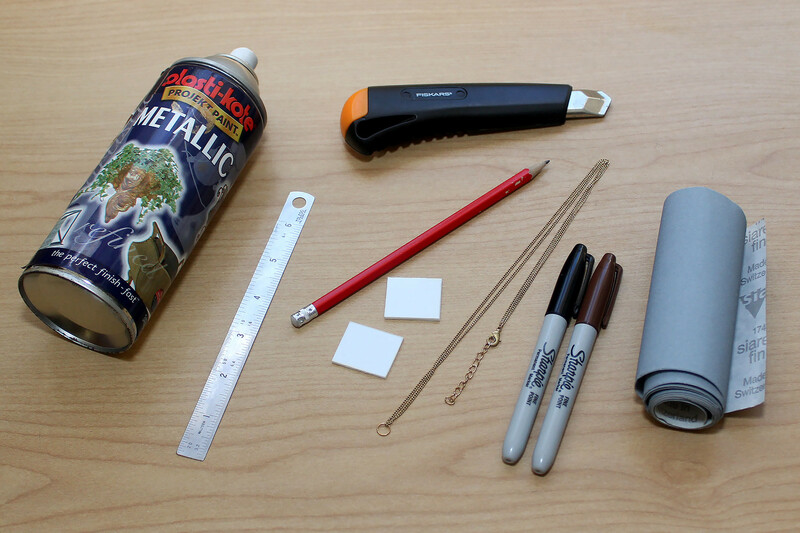 Next was the fun part – spray painting! This is where the pendant really starts to look like a japor snippet. Once I had finished engraving the details, I sanded the surface to tidy up the cut design and prepare the plastic for painting. A smooth surface will give a nicer painted finish, which is especially important for a reflective colour like gold. Placing the pendant on some spare newspaper, I took it outside and gave it a coat of a metallic spray paint. I painted one side first, left it to dry, then painted the other side. I chose gold because it felt like the closest precious metal colour to the original, but you can use any colour you prefer – silver, rose gold, bronze etc. Below you can see how different my 3 versions look all painted (left to right) – curved, flat, and curved with engraved details. Personally I love the curved shape with engraving, but it was the hardest to create – lots of practice to get those cuts right! My engraved pendant was finished, so I attached a gold-tone jump ring through the top hole and strung it onto a gold-tone chain necklace. Here you can see it next to my original prop version – it still has the all the details and shape of the original, just slightly smaller and with a gold-tone finish, for a more ‘everyday wearable’ version. I absolutely love it! For my other 2 pendants, I took a black fine-tip Sharpie permanent marker and, after a few minutes practising on paper, carefully drew the design onto the front. Don’t worry if you mess this step up, you can repaint the pendant and try again. I didn’t worry about trying to get the details too perfect, I wanted a more hand-finished effect. 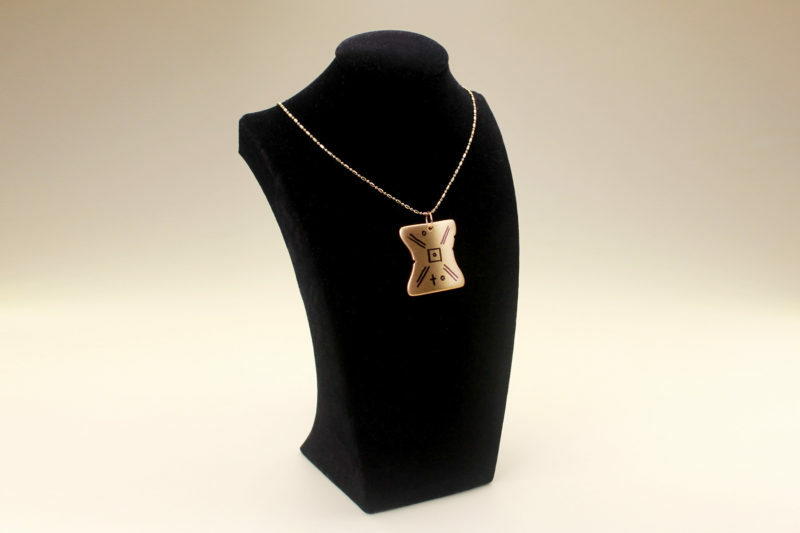 This pendant is inspired by the necklace Anakin made for Padme’, so I wanted to keep a little of the ‘hand made’ theme in the design, which is part of the romantic essence of the necklace. Once I had finished my pendants, I attached a jump ring through the top hole and hung them on a gold-tone chain. You can pick up a cheap necklace from a dollar store or make your own from gold-tone chain and necklace fixtures from a craft store. 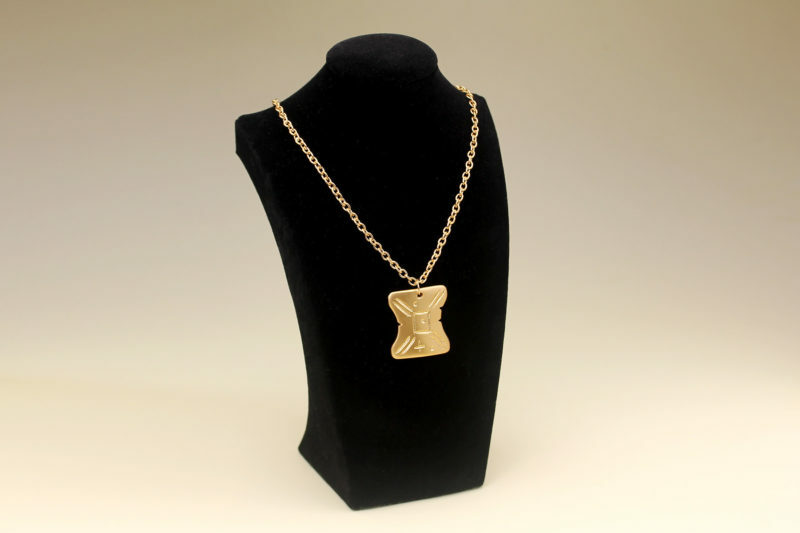 While the original version seen in The Phantom Menace is hung on cord (described as ‘Jerba leather cord’ in the Visual Dictionary), I chose gold-tone chain for my jewelry versions, to match the gold finish of the pendants. Later on we see Padme’ wearing the Japor snippet on a chain necklace in Revenge of the Sith, so it still matches the design. 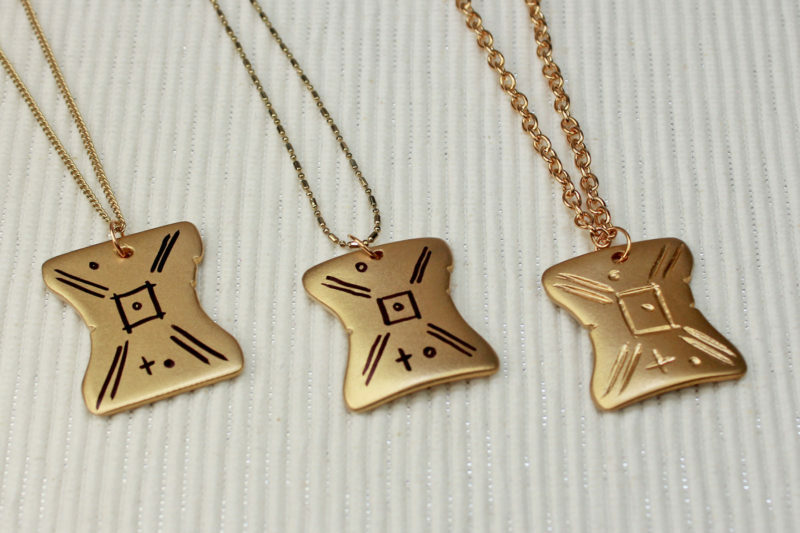 Below you can see my 3 finished versions (left to right) – flat/drawn, curved/drawn and curved/engraved. I hung them from different style chains, for a bit of variety. I am so happy to finally have a Japor snippet necklace I can wear anywhere! There are plenty of Han Solo and Princess Leia ‘I Love You’ – ‘I Know’ themed accessories, but sadly nothing for Anakin and Padme’ – the prequels have so much meaning for me, so I desperately wish there was more prequel themed fashion and accessories. 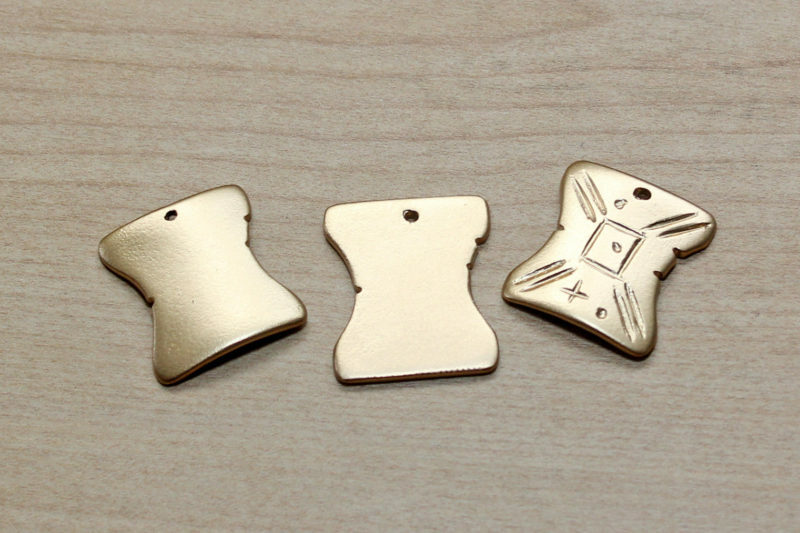 I hope you have found my DIY project helpful – I’d love to see other Japor snippet necklaces! I eagerly anticipate the day a licensed company produces a jewelry version, but for now, I’ll be wearing my own hand-made necklace. It is a perfect subtle Star Wars accessory that only fans will recognise, but carries so much meaning for those who know what the design is from. Today is Valentine’s Day here in New Zealand, so I’ll definitely be wearing mine out to dinner with my husband tonight 🙂 Happy Valentine’s Day! Previous Post New Star Wars concepts from Prophecy Girl!